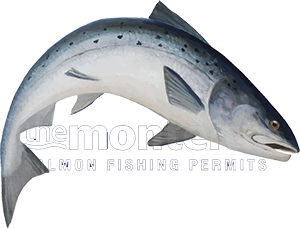 Salmon fishing these days has become an exacting science of grains & grams and specific cut lengths of exacting tungsten impregnated PVC or polyurethane sinking tips. This often makes me wonder how on earth we used to catch salmon at all in the old days! There are many who will automatically jump in and say there were more salmon around back then and it didn't matter as much but I remember plenty of blank days on the Tay through the 70's & 80's too or maybe I was just imagining it! When I started salmon fly fishing the popular line was a white Hardy double taper which had a 10 ft sink tip extruded into its front ends. When I say 'front ends' I mean 'front ends' as when the end you were using got tired after a few seasons all you simply had to do was reverse the line for a new one. No wonder the tackle manufacturer's phased out the old double tapers! On the deeper salmon pools on the Scottish rivers it often pays when the water warms and salmon are naturally lying deep in the cooler thermals to get down onto the fish but unless you can truly see the bottom of a salmon pool it's a guess as to how close you are to the riverbed unless you feel your sink tip or fly clipping the riverbed through the swing. The only way to properly assess this is to get into the river and take a look yourself with a snorkel & mask! If you do you'll be surprised as to how much higher these long sink tips are actually fishing your fly as opposed to where you thought they were performing in the water column. Relax about the above as the whole 'T' or 'Type' identification system where the number following the T represents the sink rate of the tip in 'inches per second' is only calculated when an inch of tip material is dropped into a container of still water. This sink rate 'Type' system does not take into account the buoyancy of a floating belly fly line that is so commonly used these days with most sink tips or the draw of the river flow which cancels out the majority of any tip's sink rate ability. Even when a big mend is applied after the forward delivery (allowing the tip to get a few seconds to do its job) the tip will tend to start 'riding up' on an upward plane through the middle section of the swing due this floating main line buoyancy and the draw of the river. How does all this science affect our salmon fishing line depth selection you may ask. Well it doesn't as much as you may think unless you 'intimately' know the riverbed & depth of each pool you are fishing and salmon are lying deep on the riverbed and are in 'snap happy' mode when your only chance of a 'take' is to put the fly right on their noses. Thankfully salmon will often come several feet or more for a fly and when I think back to my early days on the Tay my late ghillie mentor Willie Laird would often remark "if the salmon wants your fly son it'll let you know!" If your fly's flight path depth is half way there and there's a 'taker' in the pool you're making it much easier for that fish to intercept your fly. The shorter the distance the salmon has to travel obviously reduces the chances of that fish changing its mind after it starts its fly investigation process! Although some shallower Scottish rivers like the Spey require a full floating line for many of its beautiful salmon pools the Tay is the opposite of that. The other thing that often influences the sink tip choice for anglers is their personal ability & their fly lines ability to turn over a heavy sink tip. On the bigger deeper Scottish salmon rivers fishing a proper sink tip is often the way to go and that doesn't necessarily mean a lightly dipped thin profiled polyleader which I'd personally only consider for the front end of a proper braided core sink tip when delicate small fly presentation was required and usually only during low Summer water conditions. Personally I don't like fishing full sunk lines even though I designed one that didn't need a role cast to lift it and that came with an intermediate belly and 5 15ft sink tip choices that would hold good 'sub surface' shape profile all the way to the salmon fly business end while swinging through the pool. I think there's a few specific purposes for a full sunk line at certain times of the salmon fishing season and I don't mean in the freezing cold water of early Spring when salmon are 'naturally' holding higher in the water column where warmer water thermals are closer to that of the temperature of the North Sea where they've come from. The full sunk line from what I've personally seen works best on the deeper Scottish rivers in the warmer water of late Spring, Summer & Autumn when salmon are lying down deep on the riverbed and have 'seen it all' and you need to make it very easy for them to have a go! From a grace, elegance and personal fly fishing enjoyment point of view I like catching salmon on my full floating belly line with a 10ft, 12ft or 15ft tip and on the Tay I'm usually always on the Type 3 which is probably very close in sink density to the front end of my old Hardy double taper!